All quiet on the scrapping front. How have we been lately? Stumped for ideas? Just a little reminder that 'Crop Night' is only a week away. Seats are limited and there's a few left. Call us for a seat as soon as you can to avoid disappointment. The Doodle Genies template by Chatterbox has proven to be a hit. Even we're lovin' it!! Trace shapes/images/flourishes with a marker pen on your card/layout. Last night, I took it a little further. Staring at a nice flourish, I traced the outline with a pencil, started piercing with a paper piercer and stitched away. The outcome was LOVELY. Yet to try with bigger shapes and perhaps fill it in with chalk.... that's an idea! New arrivals from this season's Making Memories are on our shelves now. It's 'Crop Night' soon, people!! We've moved it to Friday, March 30th from 6-9pm. For 3 whole hours, enjoy the company of other fellow scrappers as you scrap, eat, chat and share ideas and tips on just about anything under the sun! At $10 per person, please CALL us directly to get a seat (please don't leave a comment to let us know you're coming). There'll be games to be played and prizes to be won too! Yipppeeee! Seats are limited. For a whole week beginning Monday, March 19, Shabby Chic will be conducting classes on creating an Accordion Album, which are perfect for displaying photos and also make nice personalised gifts for friends or dear ones. In under an hour, you will be able to walk away with a completed album. Simply bring along 4 (or more) 3R photos and materials will be provided for creating the album. The minimum class size is 2 persons. Class is suitable for persons aged 12 and above. If you have any further inquires or you want to book a slot, please do not hesitate to call us at 2424440. Hi, I’m Ruey….and proud to be a Bruneian! I actually left Brunei as an overseas student over 20 years ago and have stayed on here when I married. I have 3 gorgeous sons and we travel back to Brunei every few years to catch up with family and friends and to renew my Bruneian passport and IC. My last time back in Brunei was in July 2005 for my sister’s wedding. I had my first taste of Scrapbooking at a Creative Memories party about 4 years ago and lost interest quickly because the Creative Memories way of Scrapbooking is very basic and flat. In August 2005, after we had just come back from Brunei for my sister’s wedding, my youngest son’s kinder teacher asked me to bring a photo album of our trip so that Jeromel could do a mini show and tell. 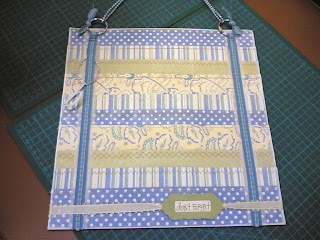 I decided to do a quick little scrapbook album and over those 2 nights…..my creative beast was unleashed. From then on, I’ve thrown myself full on into this fabulous hobby and it has been an amazing journey of discovery, creativity, soul searching, reflection and of course….shopping! Scrapbooking has given me the opportunity to tell my family’s stories creatively and given this crazy stressed out mother of 3 a chance for some ‘me’ time. In the past 18 months since I have become addicted to Scrapbooking, I have been published in all 3 of the Australian Scrapbooking Magazines and will be published soon in the Australian edition of the US magazine Creating Keepsakes. I am on the design team for my local store Arty Pants, for the fantastic Australian Kit Club Scrapping Angels as well as the USA Kit Club – One Page at a time. If you haven’t given Scrapbooking a go, don’t hesitate….. it’s not as hard or as time consuming as it looks, there is no right or wrong way of scrapping and you get a wonderful sense of achievement as you capture your family’s memories on paper. As part of my design team commitments for Scrapping Angels, I design kits a couple of times a year …..meaning that I put together papers, cardstock, and for those who know my style…the yummy stack of embellishments. With the deluxe kit, you will get full step by step instructions to create layouts as well as an online chat session where I will be available to chat or answer questions about layouts etc. So, if you have been stuck in a scrapping rut and would like to try new techniques or learn some of my scrapping secrets and get an insight into how I scrap, this is your chance. I can’t tell you what’s in my kit as it is a closely guarded secret, but I can tell you that just about everything is from CHA2007....I am so fortunate that the timing was right and I was lucky enough to have been able to pick things out of the CHA 2007 sneak peeks!!! The colours, textures, shapes, ....everything was agonised over....every little detail was ooohed and aaaaheed and ummmmeeeed and aaaaaaheeed over until I was happy with the kit. My deluxe kit will debut in May and they are limited edition kits, once they are sold, they will not be re-ordered. There is no subscription system, but you can pre-purchase with your credit card or if you live outside Australia, you will need to have a paypal account. Marie’s March kit sold out in a day and Annie’s April kit which is to be launched on the 1st April ....apparently there are under 10 kits left!!! Shabby Chic will be organising 'Ruey Crop Nights' for all those who have purchased the May deluxe kit independently or with us. If you are interested to purchase with us, please CALL us immediately as kits are limited. Dates for 'Ruey Crop Nights' will be confirmed later next month. 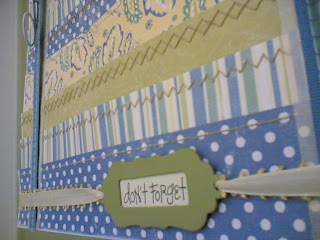 All patterned papers and ribbons used are from Making Memories' Fresh Anthology Collection. We punched a hole in the Fancy Pants chipboard. 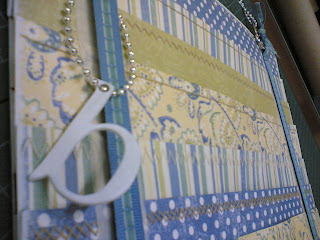 We wanted to hang both our initials but couldn't find a letter 'd' then Daryl said the 'b' can be flipped over to look like a 'd'! Clever!! So we painted them in Spotlight paint by Making Memories. I wrote those words - don't forget. I'm getting the hang of Heidi Swapp's alphabets. 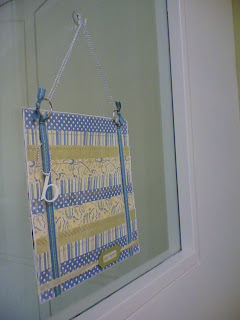 The frame chipboard is also from Making Memories - painted and glazed. We used those little metal beady strings to loop them into ring binders in order for it to hang nicely. Daryl had to ask his mum where we could find those beady strings. Tip: Check out the embroidery shop along Unitek/Kedai Komunis. Only B$0.60 for a metre! We used it to loop our chipboard letter too. 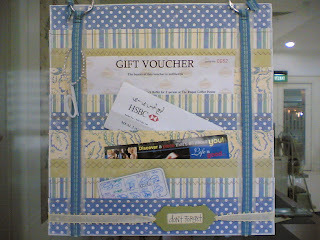 Finally, we slipped in our little vouchers to remind ourselves to use :) Definitely a worthwhile and handy project. Sorry for the late post but as it is 'Chap Goh Meh' (meaning 15th Night) tonight ie. the last day of the Chinese New Year celebrations; we'll be closing at an earlier time - 6pm. I couldn't find the link online but you can find us in the 'Feature' section if you pick up a copy of today's issue of The Brunei Times. A big shout to Yam for the write-up on us. A job well done *unlike a previous write-up whose name we shall not mention*.